In South Africa, one of our local stores sells a product they call heat and eat rolls and breads. I love keeping these in my freezer for the Sunday afternoons we have a lazy relaxed lunch. I keep rolls for hot dogs and soups and I keep bread for in case we end up having friends over for a braai. Since I started playing with my sourdough I was determined to get a recipe to work for me that would replace the heat and eat rolls I am buying. This is not only to save me money, but because I like to have home made things in my freezer as opposed to processed items. 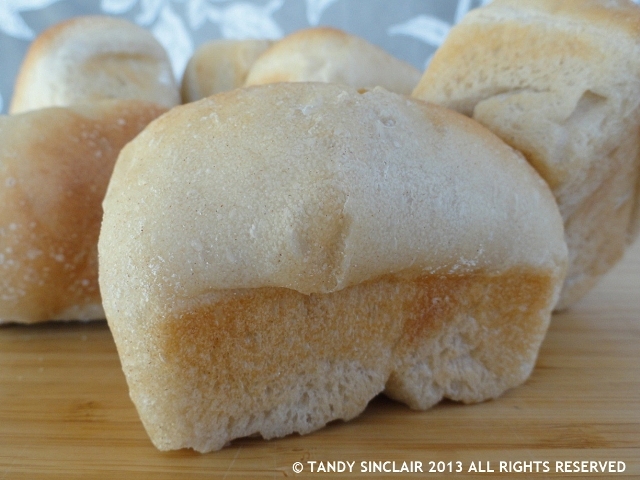 I used Brydie’s recipe for every day rolls as a base to work from and created these delicious sourdough bread rolls that can be frozen and then finished off in the oven when you want them. This is great for a family where you have children to feed. You can make a large batch of these over the weekend and freeze them the same day and then take them out as and when you need them. I also wanted to make sure that these would work by using my bread maker. I find my bread maker gives me a very good dough from which to work. And, keep watching this space as I will be sharing recipes with you for sourdough bread that can be made in your bread maker. I remember when I first made sourdough. I made too much and had to resort to storing it in a bread basket temporarily! Thanks a lot for sharing this recipe. I was actually looking for a great but simple recipe that is easy to follow and I’m so glad to have come across it. Home made is always the best. Can’t replace the for anything. We also keep a fresh stock at home but this way of making the bread is something new to me. It got me interested to try. Very interesting. Would that work for regular bread dough rolls as well? Just cooking for five minutes less than needed before freezing? Must experiment. My first sour dough experiment was a failure and I haven’t got it together to try again, but I guess I should do soon. I love sourdough bread but have never made it myself! Big yum. I’m looking forward to the bread maker recipe, Tandy…it seems to be the only way I have time to make home made bread in my house. Your bread looks so fluffy and perfect, freshly baked bread has never looked better! Having bread in the freezer is a must for me as when the craving hits, the craving hits! They look great! Easy recipe and all, I am always scared of baking bread, I attempted my first buns on Tuesday! It was fun! Bread making is so rewarding – and once you get hooked you will never look back! They look great! It seems like such an easy recipe, but I always feel scared of baking bread, however I did attempt do bake buns for the first time on Tuesday. It was fun!